At issue is the relationship between the WTO Agreement on Trade-Related Aspects of Intellectual Property Rights (TRIPS) and the UN Convention on Biological Diversity and its Nagoya Protocol on Access to Genetic Resources and the Fair and Equitable Sharing of Benefits Arising from their Utilization. The 7-8 June conference on the TRIPS/CBD linkage, was led by India, co-sponsored by Brazil, Indonesia and South Africa, and jointly organised by the Centre for WTO Studies, the Indian Institute of Foreign trade, and the South Centre. A number of developing country ambassadors underlined the need to find a way forward. Brazil Ambassador Evando Didonet said the concept of benefit sharing which is requested by the CBD is not replicated in the TRIPS. Countries need a legally binding mechanism to bridge the gap between the CBD and the TRIPS, and to amend the TRIPS, he said. He hinted at the possibility of a plurilateral process, if countries are not in a position to make progress multilaterally, adding Brazil might be ready to consider such an option. Thailand Ambassador Sunanta Kangvalkulkij said genetic resources piracy is rampant and underlined the lack of progress at the TRIPS Council, which she said facilitates the ongoing biopiracy. Chinese Ambassador Ambassador Zhang Xiangchen also said there has been GR and TK theft in China, adding that the protection of these resources is facing bigger challenges than ever before, and underlining the need for international rules. Indian Ambassador J S Deepak stressed the importance of the disclosure of the source of origin in patent applications, and mutually agreed terms. Disclosure, he said, is important to enable better assessment of inventive steps in applications, and local communities should receive adequate compensation. He too, insisted on the need for an international regime, which he said would create certainty for users while preventing bad patents. Lucia Fernanda Inacio Belfort from INBRAPI, and member of the Kaingáng indigenous peoples in Brazil, said indigenous peoples and their TK stand between the CBD and the TRIPS agreement. The CBD objectives are about biodiversity, she said, adding it is not a human rights treaty. TRIPS is in denial of indigenous peoples’ rights, and they are not allowed to participate in TRIPS Council discussions, even though indigenous peoples’ TK mean trillions of dollars in patents around the world, she added. 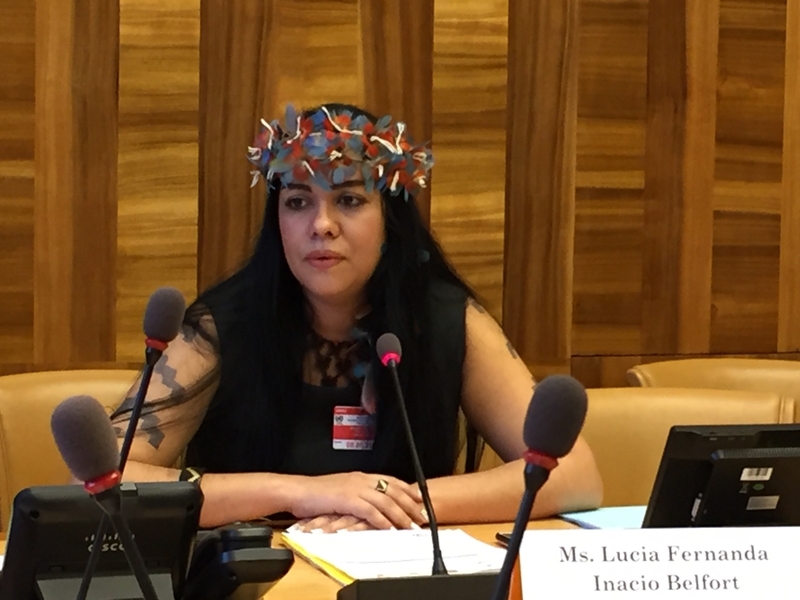 Lucia Fernanda Inacio Belfort from INBRAPI, Brazil, and member of the Kaingáng indigenous peoples speaking at the conference. She gave some examples of misappropriation, such as the andiroba tree, which has medicinal and repelling properties. Many patents have been granted around the world over andiroba, she said, wondering why Brazil did not adopt measures to challenge those patents. She also cited cupuacu, for which a trademark was cancelled after being challenged by civil society, and stevia, a sweetener used in industry such as Coca Cola without benefit sharing. She asked the audience if that seemed fair and acceptable. She also called for countries to avoid creating national legislation without consultation of indigenous peoples. According to Preston Hardison, from the Landscape Conservation Cooperative Network (US) and a legal consultant for the Tulalip Tribes, TK brings unique issues to the table that have to be addressed, and that cannot be addressed with access and benefit-sharing mechanisms. The trading system is not the right system to deal with the particular relationship that indigenous peoples entertain with their environment, their GR and TK, he argued. Hardison suggested that disclosure requirement be established at the very beginning of the research process, after researchers get the consent of indigenous communities. The WTO cannot address all industry issues, he said, but there is a need for policy coherence, he said. According to Carlos Correa, executive director-elect of the South Centre, different views prevail concerning the relationship between the TRIPS and the CBD. Developed countries view the two instruments as mutually supportive, while developing countries say TRIPS allows the patenting on GR and TK and this in practice might be a conflict between TRIPS and the CBD. The implementation of the Nagoya is proving challenging for countries, as each have different legislation in terms of implementation, he said. In practical terms, if a disclosure obligation is established, the issue is to know how stakeholders in India for example will know that a patent has been filed in other countries, he said. At the moment, information is fragmented, he said, adding that there is a need for a system providing information about patent filing in other countries. One way to reach this objective would be to have patent offices send information to an institution when a patent relating to GR or TK is filed, so that this information is accessible through a database. Joshua Sarnoff, a law professor at the College of Law at DePaul University in Chicago (US), said that GRs were once thought to be the common heritage of human kind, thus in the public domain, and were subjected to extensive appropriation. The 1962 United Nation Declaration on the Permanent Sovereignty over Natural Resources helped the situation but did not solve the ex-situ collection from the colonial era, he said. He too underlined the issue of countries protecting only their own biodiversity, and the difficult enforcement actions in foreign jurisdictions. 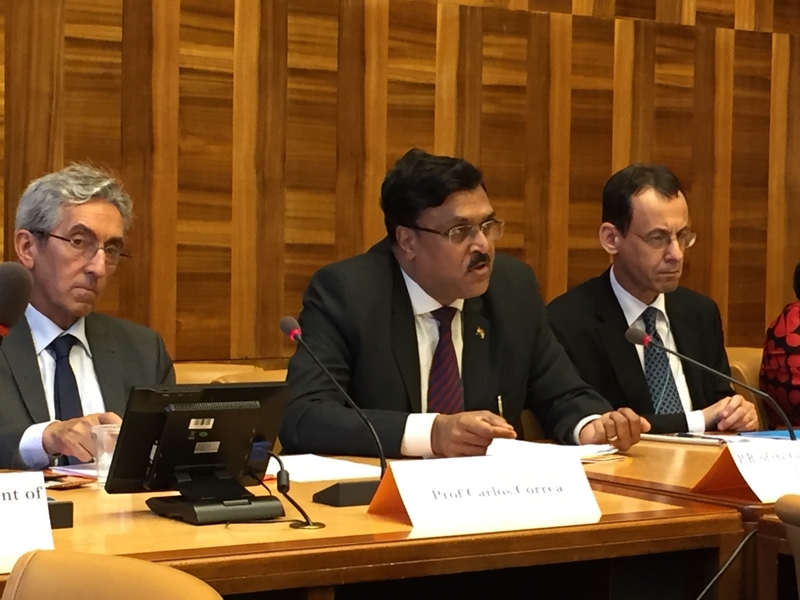 Mustaqeem de Gama, counsellor at the South African mission in Geneva, said South African laws do not operate extra-jurisdictionally. The South African legislation does not require disclosure of non-South African resources, he said, underlining the difficulty for countries to legislate outside of their jurisdiction. Margo Bagley, Asa Griggs Candler professor of law at the Emory University School of Law, Atlanta (US), joining remotely, explained how disclosure of GR could contribute to a more effective, functioning international access and benefit sharing system. It would in particular provide protection beyond borders, and could support the dissemination of information. Even countries requiring disclosure may not make that information easily searchable and it is mostly not aggregated, she said. Bagley is also a “friend of the chair” of the World Intellectual Property Organization Intergovernmental Committee on Intellectual Property and Genetic Resources, Traditional Knowledge and Folklore (IGC). She said outstanding issues in the IGC discussions include question on what source of origin need to be disclosed, how to deal with genetic sequence information, the penalties for non-compliance, and how disclosed information should be disseminated. Additional problems, she said, are that countries want their own system to become the international one, the high turnover of negotiating personnel in Geneva missions, and the lack of trust among country representatives. The IGC is next meeting from 26-29 June. Edward Hammond from Prickly Research (US) talked about disclosure of origins in WIPO patent applications. He authored a 2016 publication, published by the Third World Network, on disclosure of origin in patent applications under the Budapest Treaty on the International Recognition of the Deposit of Microorganisms for the Purposes of Patent Procedure. From July 2013 to November 2015, out of 158 applications in relation to the Budapest Treaty, “the vast majority” of the applications did not disclose the origin of the GR, the publication showed. "Major Emerging Economies Push To Revive Discussions On Genetic Resources Misappropriation At WTO" by Intellectual Property Watch is licensed under a Creative Commons Attribution-NonCommercial-ShareAlike 4.0 International License.